Mommy and I witnessed something tonight that left us speechless. Alyce, our daughter shared! And it wasn't a little share; this was a big share. Tonight Mom and I went to Locomotion Commotion. It was a one time class at the early childhood development center of our school district. Locomotion Commotion consists of a bunch of kids all playing in a gym with a myriad of different toys. Alyce is a big fan of the gym. Every time Alyce attends they put out a different set of toys with a few larger pieces of equipment sticking around. One of Alyce's favorite things to do is to go down the slide. Another one of Alyce's favorite things at the center are the push cars. Push cars are the same childhood toys that mom and I had. 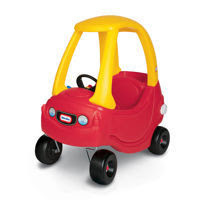 Whenever Alyce sees one of these toy cars she HAS to have it. Tonight was no different when we showed up. Alyce made a bee line to the car and claimed it as her own. 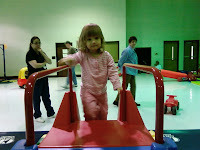 After a while we pulled Alyce away from the car and onto other things like the slides or stacking blocks. Later in the evening Alyce again took possession of the car. However she took possession in front of another pint sized playmate. This is where things get interesting. Alyce noticed this other boy crying about the car. Alyce got out of the car, held the door open, and gestured towards the boy. She was willing to share the item she held most dear. Mom and I were dumbfounded. It was great to see a milestone right in front of us. Our little girl is growing up right before our eyes.